James Ewell isn’t one to sing his own praises, but he is a storyteller with an account that captivates generations. 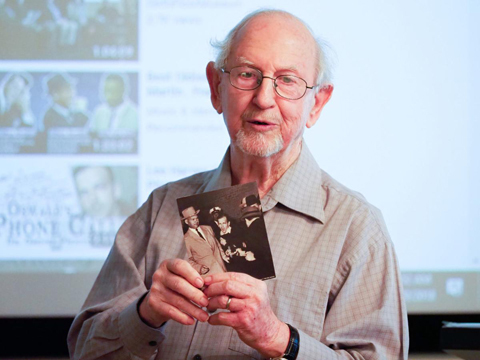 Ewell, 89, was a Dallas Morning News police reporter when the assassination of President John F. Kennedy occurred in Dallas nearly 55 years ago, and he told his story to an audience at his assisted living home — The Village Assisted Living & Memory Care — in Denton on Tuesday morning. He witnessed the president land at Dallas Love Field the morning of Nov. 22, 1963, saw a Secret Service agent clinging to a speeding presidential motorcade seconds after Kennedy was shot and witnessed the arrest of Lee Harvey Oswald inside the Texas Theatre later that day in connection with the killing of Dallas police Officer J.D. Tippit. Ewell saw the shooting death of Oswald by Jack Ruby on his home TV set on Nov. 24, two days after Kennedy’s death, and once again rushed to the scene of a killing. Five and a half decades did not seem to have dulled Ewell’s memory of the day much, but he’s had plenty of practice telling this particular tale. Despite never publishing a book of his own account, Ewell has been featured in myriad books, collections, documentaries and panels to discuss his part of a national tragedy. He peppered his presentation Tuesday with side stories and tidbits that made his account distinctly personal and journalistic. For example, he told the audience of about 20 the names of officers on the scene and where Detective Jim Leavelle bought his white suit worn in an infamous picture of Oswald’s death; the suit was from Neiman Marcus. Ewell even related good-naturedly how he lost a potential fortune over a single photograph when he sold the now-iconic autopsy picture of Oswald for $200, which would be worth a little more than $1,600 when adjusted for inflation, according to the U.S. Bureau of Labor Statistics. “That guy I sold it to for $200 became a rich man,” Ewell said. He cited one often-overlooked incident from that fateful day in 1963 as his reason to continue telling his story: the shooting death of Tippit by Oswald. It isn’t clear why the officer stopped Oswald for questioning or why he exited his squad car to talk to him, after which he was shot dead with the assassin’s .38 revolver. Even though Tippit wouldn’t have known of Oswald’s significance, Ewell maintains that the officer’s intervention and sacrifice changed the world. After the killing of an officer in broad daylight, Oswald was hunted across the Oak Cliff region of Dallas. Tippit was posthumously awarded the Medal of Valor by the National Police Hall of Fame, among other awards, in 1964, according to the Officer Down Memorial Page. In 2012, 49 years after his death, Tippit was honored with a state historical marker near the scene of his death in Oak Cliff. Invariably, Ewell said, he is always asked about conspiracy theories — involving the Mafia because of Robert Kennedy’s work against them, the CIA or Cuba because of Kennedy’s dealing with the Bay of Pigs, Russian operatives or somebody else entirely. “To this day, 55 years later ... I don’t know,” he said. Ewell still receives mail requesting autographs and additional information from across the world, said his daughter Tracy Reynolds. She has become an unofficial publicist and agent for her father, encouraging him to get his story to the public.